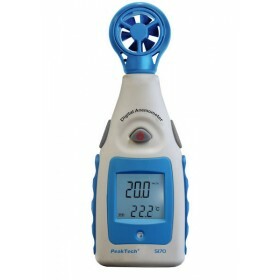 Professional Vane-Anemometer &amp; IR-Thermometer with USB 2 in 1 Vane anemometer with built-in noncontact IR thermometer and digital multifunction LCD display and backlight, measures air velocity, air flow (single point) and remote surface temperatures to 500°C (932°F) with 30:1 distance to spot ratio and laser pointer. This unit is suitable for use in installation, repair, diagnostics and optimization. Fume hood testing, installation and verification. Ventilation system installation, servicing and analysis, environmental wind and temperature testing / analysis. Boiler rooms, ionizer flow output monitoring, automobile aerodynamic testing, plant / facilities maintenance. 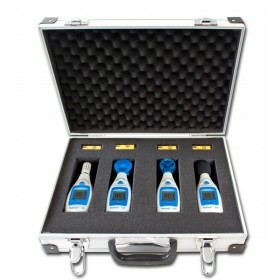 The USB interface and the software enables the record of measuring values for a longer period. 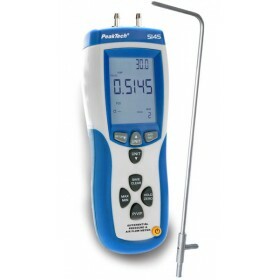 "2 in 1" Professional Pressure-Difference &amp; Air Flow Meter with USB Microprocessor controlled 2 in 1 meter for determining pressure, pressure difference, Air Velocity and Air Flow, with a digital multi-function display and backlighting. The ambient and air temperature can be additionally detected. 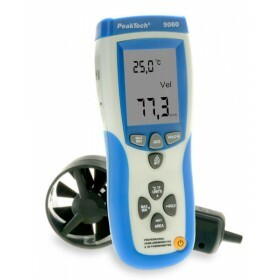 This combination device enables the use in installation, diagnostics, repair, maintenance and optimization of air conditioning, heating and ventilation systems and uses a pitot tube to capture the different readings. 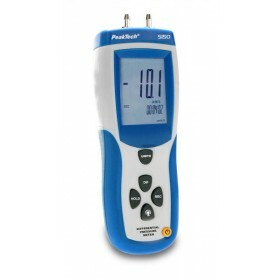 The USB interface and the software are used for recording of measurement values over extended periods and read out the built-in memory of 99 measurement readings.